Willy Russell’s heart warming comedy Shirley Valentine premiered in 1986 and took the world by storm. 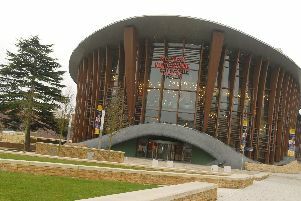 In celebration of its 30th anniversary, the first major revival of this popular story arrives in Milton Keynes at the end of the month with Jodie Prenger in the title role. Shirley is a Liverpool housewife. Her kids have left home and she makes chips and egg for her husband while talking to the wall. Where has her life disappeared to? Out of the blue, her best friend offers her a two week trip to Greece and she secretly packs her bags. Shirley heads for the sun and starts to see the world and herself very differently. Shirley’s story has won awards in the West End, on Broadway and in the film world and has appeared in many tongues across the globe in countless productions with many great actresses in the role. Ms Prenger is best known for winning the role of Nancy in the West End production of Oliver! through the BBC series I’d Do Anything. She has also starred in Tell Me On A Sunday, Calamity Jane and Spamalot. She is a regular presenter on BBC Radio 2. Shirley Valentine comes to Milton Keynes Theatre at 7.30pm from Monday March 27 through to Saturday April 1 with additional 2.30pm matinées on the Wednesday and Saturday. Tickets from £15, book online at www.atgtickets.com/miltonkeynes or call 0844 871 7652.